Founded in 2014 and based in San Francisco, Dealpath is the leading deal management software platform for commercial real estate investment and development teams. Led by an experienced team of industry executives and technologists, Dealpath provides commercial real estate deal teams with smart pipeline tracking, collaborative deal management and powerful reporting to achieve optimal outcomes. Dealpath focuses on increasing transparency, collaboration and accountability for world class execution. The platform enables teams to build a collaborative database of every deal they’ve ever looked at or work on with the accountability and enterprise risk management that firms need, all from an interface that teams want to use. Dealpath is a web-based application built in AngularJS, Ruby and MySQL. Commercial Real Estate (CRE) transactions are complex and take months to complete with mountains of information to understand. From initial screening to underwriting and due diligence, all the way through closing, there is an abundance of data and documents being processed among stakeholders and service providers. Dealpath solves several major issues for commercial real estate investment teams including reducing time intensive tasks, centralizing critical pieces of data through automation, and increasing communication. By streamlining workflow and easing collaboration, real estate investment professionals can better evaluate deals and mitigate potential risks. Users have full visual views of their deal pipeline and portfolio, can communicate through the platform to stay on top of critical dates and tasks, can search for any file they need, and have instantly updated reports at their fingertips. Box Platform plays an essential role in the Dealpath architecture by providing enterprise-grade storage capabilities and powerful file preview functionality. By using Box Platform to power the content management aspects of their platform, the Dealpath team has been able to focus on important features and functions unique and essential to commercial real estate. 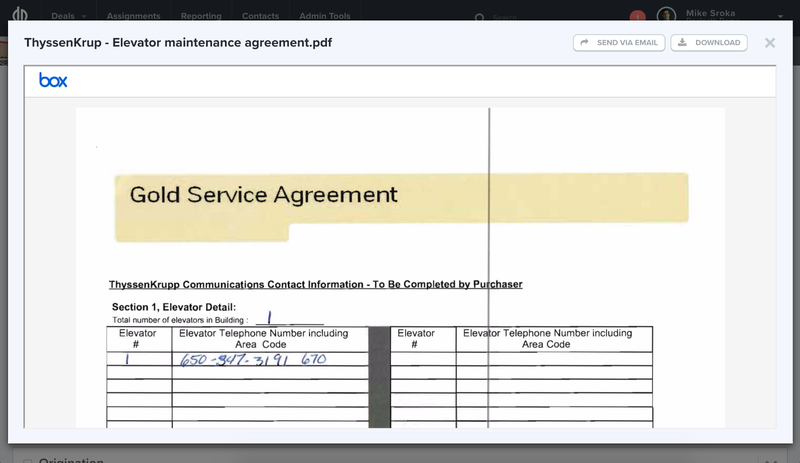 Using Box Platform App Users, users of Dealpath can securely upload and store relevant files at both the deal and specific task level, to effectively and easily manage tasks and information related to CRE transactions. Box Platform’s encryption capabilities and compliance certifications enable users to comfortably store and share important files. Moreover, Dealpath users can also upload content from their Box accounts using the Box Content Picker, which allows the user to authenticate using their Box user credentials to upload files from their own Box account to their Dealpath account. 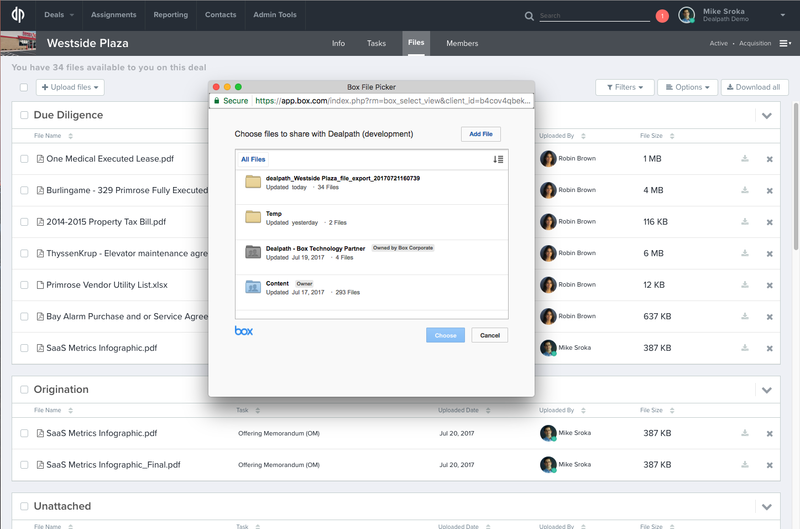 Users can also view those files using Box’s preview functionality, allowing users to quickly view documents directly in the Dealpath interface without having to exit their workflow. In addition to Box Platform, Dealpath integrates several other cloud services to power their application. 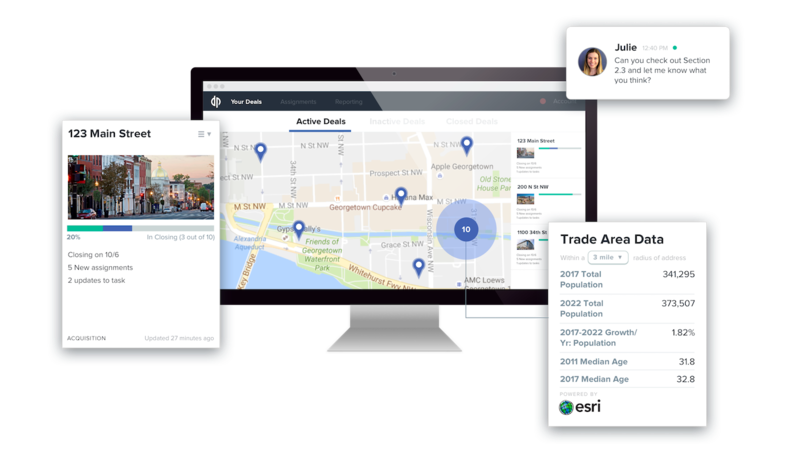 The Dealpath application is deployed to AWS, and leverages ESRI for property-level demographic and trade area data, Google Maps for displaying address location in the dashboard, and Google Photos for images and photos associated with a particular site.